Podiatrists see patients with knee pain caused by overuse injuries and those related to malalignment of the foot and lower leg. It is thought that a majority of all lower back and knee problems, not caused by direct injury, are actually related to abnormal foot function and leg alignment. Studies show that foot related postural problems can refer pain to other parts of the body. Excessive pronation – an overpronated foot results in excessive internal rotation of the lower leg causing a twisting effect through the knee. 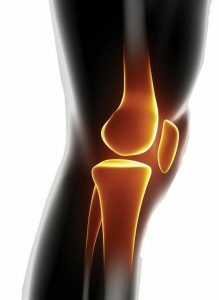 The alignment of the knee joint itself and of the kneecap (patella) to the knee is affected. With increased load and use, as happens in sport, damage frequently occurs in and around the knee. The knee can suddenly become painful, inflamed, and swollen or as more often is the case, it comes on gradually as more wear and tear occurs. Excessive supination – a supinated foot is generally a poor shock absorber, causing impact forces during walking and running to be transferred up the lower leg and be absorbed by the knee. The knee then becomes prone to injury. Taking a thorough history, assessing which structures around the area of pain are affected and assessing the mechanic of one’s feet and legs is vital to stop and prevent foot related knee and hip and lower back pain.